Often at times you will struggle to find a tennis practice partner, don’t look at this negatively as you have many ways to improve your tennis alone. One of the best ways you can improve your tennis game is by hitting against a tennis backboard or wall. 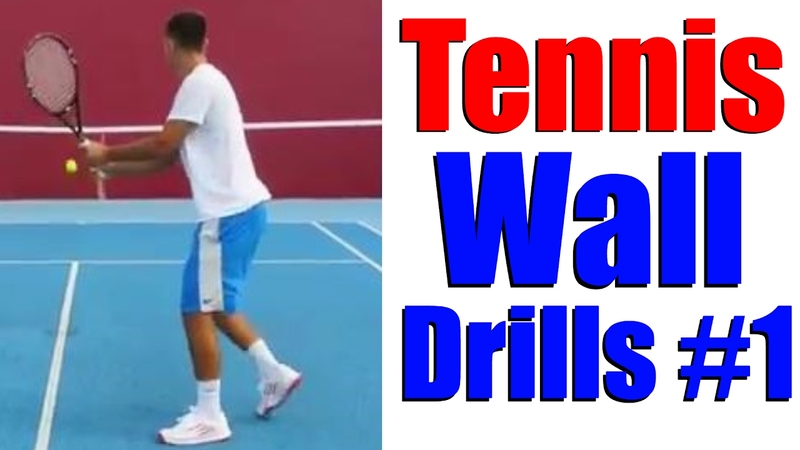 The first exercise will be hitting as many forehands as you can handle in a row. If you imagine a power scale of 1-10, 1 being the softest you could possibly hit and 10 being your hardest shot, start off on level 4-5 and build up as the drill carries on. This way you build you improve your ball control and the rallies will last much longer so you will hit a lot more balls than if you start off on an 8 or 9. Focus on shorter backswings and giving yourself good margin by hitting with good topspin and height so you have time to prepare for the next shot. Now you've worked the forehand, it's time to do the same on your backhand. Hit as many backhands in a row as you can again by starting on 4-5 on the power scale and building up slowly as the rally progresses. Focus on moving your feet into the right position as early as possible and setting up behind the ball. A good starting base will be a rally of 8-10 strokes in a row. Eventually with practice you would want to reach rallies of 20-25 strokes in a row whilst controlling the ball fully. The next step is to work on both the forehand and backhand groundstrokes together. One of the easiest and most effective ways to do this is by hitting two forehands in a row, followed by two backhands in a row. You might find that too difficult to start off with in which case you could do three strokes on each side. The ultimate progression is then to hit one forehand, one backhand over and over again for a rally of 15-20 balls. After you have worked on your tennis forehand and backhand groundstrokes, the next step is to work on your slice. This can be both the forehand and backhand slices. Start off by hitting only forehand slices, then do the same on the backhand. Try to aim for rallies of ten on each side. Next try to hit alternating forehand and backhand slices for as many strokes, in a row as you can. A good target to begin would be 8-10. The next drill is now alternating between the topspin drive and the slice. Once again this can be done on the forehand side, then the backhand side, plus a combination of all four strokes (topspin forehand, slice forehand, topspin backhand, slice backhand). When doing this drill focus on keeping the slices as low as you can and hitting with good height on the topspin groundstrokes. This will be perfect for when trying to mix it up in a point situation. The last phase is now working on the net game. The first drill is to try to hit only half volleys (just after the bounce) using the continental grip that we use for serving. Go for 10-20 half volleys in a row. Next we work on normal volleys, again go for sets of 20-30 balls in a row. And lastly we work on our overhead smash. This is not an easy drill to do so you might want to keep it to 1-2 smashes followed by stopping the ball and feeding again.